Lindsay Mason: Sneaky Festive peeks! It's been a lovely day at Card-Io today...hello to everyone who came along and apologies for burning holes in your pockets and purses! Hope you all have fun with your new stamps, papers and inks though. I don't have pictures of finished pieces tonight, but I do have sneaky peeks of some of my new Christmas stamp designs. These should be available from the end of July/beginning of August, so if you did want to pre-order any of them, just ask your local Personal Impressions stockist. If you want to see more of P.I. 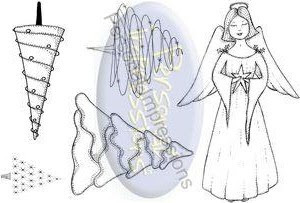 's latest designs, check out the website at www.personalimpressions.com, click onto "products" and then "Art Stamps" where you can look through all the various sections and designers. To browse my designs, click "products" then scroll down to my section "Lindsay Mason Designs". So, here are just a selection of them. This first one is an A6 clear set entitled "Christmas Bunting & Baubles" PICSA6262. Sorry that the bunting is upside down, but sometimes things have to be turned around to fit them on the stamp sheets! 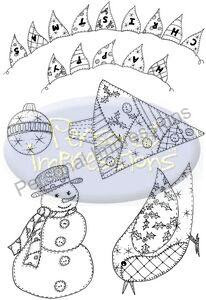 Of course there is a snowman in this set as I get asked for new ones every year! Next is another A6 clear set which is called "Build a Snowy Scene" PICSA6261. This one is in response to requests for the tree stumps and fences etc that I add to my Distress inked backgrounds with water spritzed snow. 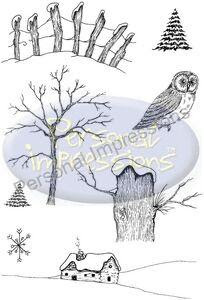 You'll be able to make a whole range of different wintery landscapes with this set of images without worrying about drawing in pesky fence posts yourself! 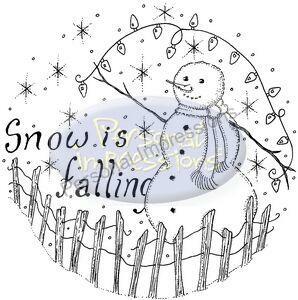 The next design is an unmounted rubber single stamp entitled "Snowy Circle Collage" PIRS025. The unmounted rubber designs all have coloured images on the packaging, but I don't have those to show you, only the black and white ones. Hopefully this one will please the snowman fans again! Next is another A6 clear stamp set called "Angelic Christmas Trees" PICSA6259 - I've turned this image sideways so you can see the Angel properly. Some of you may recognise her as being very similar to the Angel that I drew for my own Christmas cards last year and I had lots of requests to design her as a stamp. 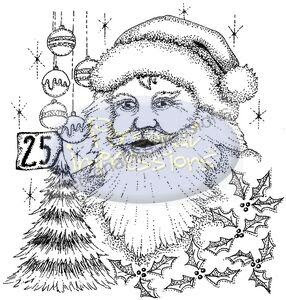 Finally, for this first sneak peek, here is another unmounted rubber single stamp called "Christmas Collage" PIRS027 - again, the packaging for this stamp has a coloured image of the design. 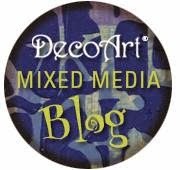 This one can be used as a flat image, decoupaged or elements stamped, coloured and cut out to use on their own. I'll show some more of the new designs over the next couple of days and will be making some sample pieces with them over the next few weeks that I'll post on here. I have taken on board the many comments on here, by email and in person, to design some of my quirky Art Journal images into stamps, so will see what can be done and will keep you posted! Have a great Sunday everyone - think it could be another nice day. Love the "Build a Snowy Scene" set !! Hope Thomas is behaving himself ?? thank you lindsay for a lovely day filled with fabulous demonstrations, and how naughty of me to nod off, so sorry, it wasn't due to the company i was keeping, looking forward to the new crimbo stamps, happy cragting little miss naughty??? I reckon all those stamps will be super sellers. I personally love the trees and fences and I especially love the tree made with swirly lines. So looking forward to the samples now. Wow! Wonderful stamps Lindsay - I love them all.